REPLACING AN ELECTRONIC UNIT with a real pipe organ is the dream achieved when preconceived notions are set aside. Four organbuilders were challenged to design an organ for this fifty-seat “jewel box” chapel, and the contract was awarded to Glück for this six-rank instrument. Inspired in concept by Georgian chamber organs, it occupies a footprint of only 34 x 120 inches. The pipes are at eye and ear level in this intimate space, and every tonal nuance is transmitted with frank immediacy to the listener. 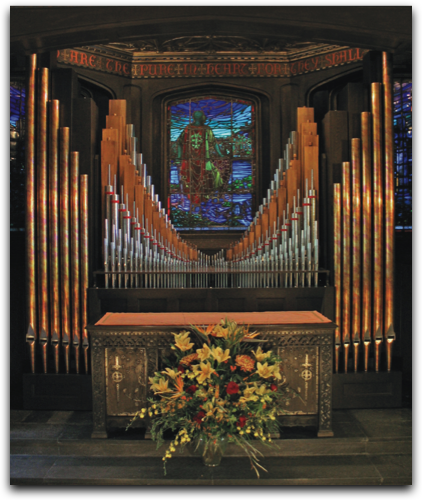 Both Glück organs at The First Presbyterian Church may be heard on compact disc.